A well equipped Hybrid Library (i.e., a combination of print & non-print materials / technology & e-resources) is the demand of the day. Suiting this demand, the school library is a spacious, well-lit & air conditioned academic hub of the institution; and houses around 15000 books on varied topics ranging from fiction, non-fiction, reference books, text books and books of special nature like career guidance books etc.. Various periodicals like newspapers, magazines & journals are subscribed by the library. Equipped with extensive hard copies & online/e-resources viz., audio-books with head-phones, video-books, e-books, & audio-visuals as in CDs, DVDs, VCDs; the library is up to date & furnished with modern elegance. Smart board & digital projector are used to teach library skills & conduct various activities for inducing more interest in students towards library. Each student is motivated & guided to sharpen his/her reading skills acumen during the library period. New arrivals & informative articles are displayed on the library bulletin board. 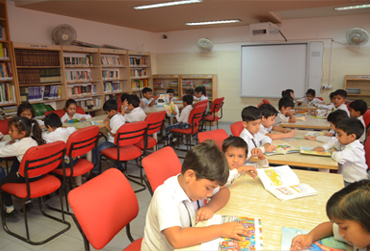 Separate Reading Room is provided for senior students & staff which also serves as a Resource Centre. The library collection is physically verified every year during the summer break & record of the same is properly maintained.